ByteScout team created new online applications, take a look! This online SQL trainer is a great exercising application for those willing to learn SQL or to improve the knowledge. It is based on our great database of SQL queries with relative deep SQL examples. If you are an experienced SQL programmer, check the advanced version of SQL trainer. The SQL online application is fast and easy-to-use with an incredibly friendly interface. It is a smooth basic tool for developers of any level. All you need to do is to type and run SQL queries. The program will notify you whether the SQL code is written correctly or there are some errors to be worked on. The process is interesting and gratifying. You will improve programming skills and move up to a new level quickly. You can run the online SQL application as many times as needed. The progress bar will showcase how it is going with learning SQL. If you want to be an SQL expert, you need to first understand what databases are and how they work. SQL has revolutionized databases as we used to know them, making the entry and extraction of information seamless if you implement the correct codes and commands. Relational databases are commonly used by different types of companies throughout the world in need of large data storage that remains simple to input, use, categorize and store data. Databases can be filled with a plethora of information all relating to a company’s products, sales, customers, addresses, and more. There is no limit to what a database can contain, allowing all information to be stored securely and efficiently. However, intricate databases can make database management a complicated process for those who have yet reached expert level in SQL language. If you wish to fully understand and reap the benefits of having a relational database in action, you need to learn about SQL and our SQL app can provide you with friendly-to-use and interactive online SQL practice. The application offers SQL learning tools and gives you the possibility to practice how to use a SQL database. You will also gain experience in how to write SQL queries correctly in a safe and secure manner before applying your knowledge to another database. It is a neat and handy SQL tutorial app that will enrich your understanding of how SQL works with firsthand experience. SQL stands for Structured Query Language and it is the mother tongue of all databases. It is solely responsible for querying and editing all stored information inside any given relational database. Our SQL learning app can be the online practice tool that will help you fully comprehend SQL queries and processes by allowing you the opportunity to put what you know to the test. SQL is necessary to communicate with and manipulate all relational database management systems. SQL statements help data analysts update or retrieve any given data stored in the database. Data analysis is useful for many reasons, including but limited to improved company efficiency and to determine statistical information. Databases are structured into tables of rows and columns. In a relational database, one table can relate to another table, creating a more complicated connection that SQL helps code, decode and process. There are many different types of SQL implementations, which are rarely compatible with each other, but learning the basics of SQL will help make relational database management easier and more empowering. How will the SQL learning app help me? Our app is a special SQL programming tool that is specifically designed to allow you to practice and absorb how to learn SQL online, conveniently and with no extra software. The SQL app was made as a practice and learning application that can help beginners and intermediate SQL users alike. We constantly create new tools for developers and we’d like to help them learn new programming skills. 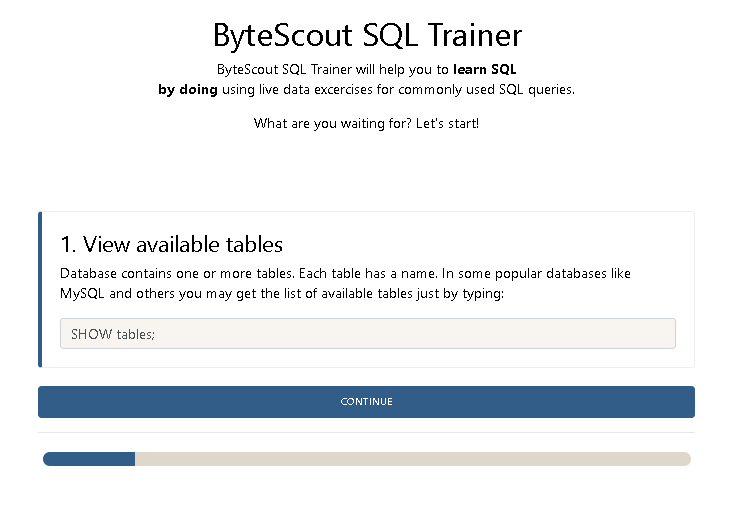 Enjoy ByteScout free SQL trainer and other apps. More tools are coming soon! We have SDKs and free desktop tools for beginner and advanced programmers. You can try our offline developer utilities. Contact us for any help!